Shown above: 2 Giorgio Club Chairs, and 1 Giorgio Sofa. Whether you are looking for relaxed seating indoors or out, modern or classic, the Giorgio seating collection has everything you need. 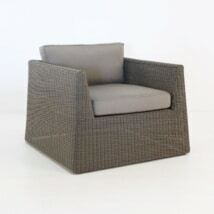 We combined classic outdoor wicker with a modern and simple shape. It has a smooth organic feel with contemporary sophistication. The Giorgio outdoor wicker furniture collection is made with outdoor wicker and Sunbrella® fabric. The wicker is beautifully woven over a powder-coated aluminum frame. Combining these durable materials make it perfect for the outdoors. But we also love they way this collection looks indoors. If you love a modern look, but don’t want to go overboard this collection is perfect. This collection comes with an outdoor sofa, loveseat and lounge chair. The wicker color is called Kubu, which is a lovely brownish grey color. And depending on your personal style you can pair this collection with one of our A-Grade teak or raw concrete coffee tables. 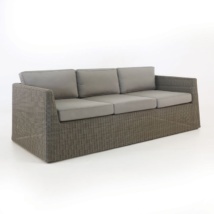 The Giorgio collection is also available in a black wicker weave. Call us today or stop by our showroom to see for yourself. We have a large variety of outdoor wicker in different shapes and styles.